Align your flight path with your initial reference point and establish straight-and-level flight at the recommended airspeed. Begin a gradual climbing turn toward the 45° point, increasing pitch attitude while you slowly increase the angle of bank. As you pass through the 45° point of the turn, your pitch attitude should be at its maximum and your bank angle should be about 15°. From 45° to the 90° point you should begin to decrease your pitch attitude to the horizon and continue to increase the angle of bank. 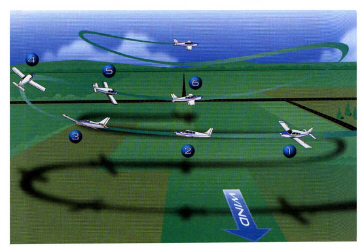 At 90°, you should be in a level flight attitude, at the maximum angle of bank (approximately 30°), and your airspeed should be about 5 to 10 knots above the stall speed. Then, slowly begin to roll out of the 30° bank and gradually lower the nose for the descending turn as you allow the airspeed to increase. When you reach the 135° reference point, the nose of the airplane should be at its lowest pitch attitude. Continue a gradual rollout and allow the airspeed to continue to increase, so that you are in a level flight attitude at your entry altitude and airspeed as you reach 180° of turn. At this point you should immediately begin a climbing turn in the opposite direction toward the selected reference point to complete the second half of the eight in the same manner as the first half. Exhibit knowledge of the performance factors associated with lazy eights. Select an altitude that will allow the maneuver to be performed no lower than 1,500 feet AGL or the manufacturer’s recommended altitude, whichever is higher. Select a prominent 90° landmark in the distance. Establish the recommended entry power and airspeed. Plan and remain oriented while maneuvering the airplane with positive, accurate control, and demonstrate mastery of the airplane. Achieve a constant change of pitch, bank, and turn rate. Maintain an altitude and airspeed consistent at the 90° points, +/-100 feet and +/-10 knots, respectively. Using proper power settings, attain the starting altitude and airspeed at the completion of the maneuver, +/-100 feet and +/-10 knots, respectively. Achieve a heading tolerance of +/-10° at each 180° point.